Langley, Jack Saword made appreciated visits to Langley and Fleetwood, telling of the work in El Salvador. Kamloops, The saints were greatly encouraged with their annual conference in late June. Brethren sharing in the meetings were: J. Abernethy, H. Bouwman, B. Funston, E. Panmenter and D. Richards. On the Monday, a number of believers helped to distribute Seed Sowers packets in the Westsyde district in view of tent meetings from July 4-25 with David Richards and Bryan Funston. Vancouver, William McVey visited a number of Vancouver and area assemblies in late May and early June, giving appreciated ministry. At Fairview on June 6, Jim Currie and Tom McNeill shared in the monthly ministry meeting. In late June, Eric Parmenter visited Deep Cove, North Vancouver and Carlton. Prior to leaving for the UK, brother Parmenter shared the monthly ministry meeting in Carlton with Jim Currie on July 4. Westhank, Following the Kamloops conference, Eric Parmenter had two nights of appreciated ministry. A Seed Sowers distribution was planned for some surrounding towns in early July. Brandon, The assembly enjoyed visits recently from J. Allen, J. Baker, A. Bergsma, J. Cunnie, A. Dryburgh, T. McNeill, P. Simms, P. Smith, P. Thiessen and J. Webb. Clinton, A week night visit from Sam Maze telling of the work in the West Indies was interesting and appreciated. Deseronto, The saints enjoyed a recent ministry meeting by Tom McNeill. The areas around Deseronto, Napanee and Selby were covered with Seed Sowers texts in preparation for a gospel series starting at the end of July in Selby by Eugene Badgley and Ross Vanstone. Gore Bay, Alvin Cook and Alan Bran-don (Lake Shore) commenced a series in the gospel on June 27. Kapuskasing, On May 23, David Rodgers gave ministry and a missionary report, and on June 7 Alex Dryburgh visited for ministry. Prayer is requested for gospel meetings which Bruce Rodgers and Brian Owen expect to start on August 1. London, Sam Maze was with the assembly for a weekend, giving a report on the work in the Caribbean and speaking at the SS picnic. Leslie Wells (May 16) and Gene Higgins (June 6) made appreciated visits also. One sister was baptized and another sister was received into fellowship recently bringing added joy. Midland, Prayer is requested for tent meetings commencing August 8 with Harold Paisley and local brethren. Rexdale, Prayer will be valued for a gospel series which Fred Krauss and Jim Jarvis expect to begin on September19. St. Marys, Shad Kember Jr. and Frank Sona had a four week series in the gospel recently with some blessing in salvation. Sudbury, On June 28, Brian Owen and Larry Buote started gospel meetings. Thunder Bay, The assembly appreciated visits by Jim Currie on May 25, Alex Dryburgh on June 8 and Hans Bouwman on June 14 and 15. Welland, The recent renovation and elevator installation at the hall were completed in March. David Rodgers gave help at the ongoing Spanish meetings held every second Lord’s day afternoon. Recent visits by J. Smith, G. Sharp, L. Steers, I. Walker, B. Rodgers and L. Buote were appreciated. Atholville, Leslie Wells and Gerard Roy held three weeks of gospel meetings in this village near Campbellton. There is no assembly nearby, but some Christians drove a distance to help. Several villages were visited and a number of unsaved were present at the meetings. Baddeck, The Lord blessed in the salvation of a number of souls during a gospel series by Peter Ramsay and Stephen Vance (Lansing). Halifax, From June 25-27, a Bible reading conference was held with larger attendance than former years. The seven Bible readings took up the Person and Work of Christ with special emphasis on the practical application of truth. The readings were opened by Norman Crawford, Murray McCandless, David Oliver, Leslie Wells and Stanley Wells. River Hebert, On May 29, Peter Ramsay spoke to over 100 children and adults at the SS Picnic. Visits and ministry by Stanley Wells and Ken Taylor on July 1 were appreciated as was a visit by Noel Burden on July 4. Corner Brook, The annual conference was smaller this year but the ministry given was appreciated and a sense of God’s presence was felt. Gander Bay, Prayer is requested for a tent series which Carl Payne and Alvin Blake plan to start on August 1 in the nearby town of Carmanville. Sandringham, The Christians were encouraged by a visit from Wallace Buckle in June. Tacoma, Three souls professed salvation during two weeks of gospel meetings by Lorne Mitchell and Jerry Jennings in June. On the way out west, our brethren visited Burwell, NE, Salem, OR and Forest Grove, OR. During the meetings, they also visited Seattle, WA. Forest Grove, Gospel meetings by Roy Weben and John Fitzpatrick were blessed with salvation. Over 7,000 Seed Sowers were distributed in the area with a good response. Sunnyslope, A week of ministry by James Beattie from the Book of Ruth was a blessing to the assembly. Garnavillo, The June conference was very good with helpful ministry given by T. Baker, A. Christopherson, Shad Kemben Jr., M. McCandless, E. McCullough, R. Orr, G. Patterson, W. Skates and J. Slabaugh. David Gilliland was expected for five meetings from July 5-9. Hampton, From May 18-20, the saints appreciated three nights of ministry by Jerry Jennings. Hitesville, Allan Chnistopherson and David Gilliland gave excellent ministry on July 26 and 27. Postville, Speaking in Spanish, Tom Baker had a week in the gospel in June with blessing in salvation. Blue River, Recent gospel meetings by George Patterson and Ed Miller were a great blessing and encouragement. Four young people professed, one being an outsider who had never been in before, although living one block from the hall. New Lenox, James Beattie spent Lord’s day, June13 with the saints and his visit was appreciated. Gary Sharp was present for Lord’s day, June 27 and remained for a week of profitable children’s meetings which were held in a tent in the back yard of one of the brethren. Tylertown, Our dear brother Lloyd Ballhagen was taken to hospital in late June. In the hospital, he suffered a majon stroke and was transferred to the University Hospital in Jackson, MS. Mrs. Ballhagen is also in hospital. These dear fellow believers need our prayers. Alpena, Prayer is requested for tent meetings which Larry Perkins and James Beattie intend to begin on August 8. Jackson, Gary Sharp spoke at the SS Picnic on June12 and had well attended children’s meetings the following week. David Gilliland’s visit in early July was very deeply appreciated. Kinross, Larry Perkins and Stuart Thompson planned tent meetings commencing July 11 in this new area in fellowship with the assembly at Sault Ste. Marie, MI. Sherman, Prayer will be valued for a gospel tent series which Roy Weber and Stuart Thompson plan to start on August 15. New Creek, Walter Gustafson and Wilham Skates expected to begin gospel meetings on July 18. DeLand, The saints were encouraged in June when a teenage girl obeyed the Lord in baptism. A friend, who had professed in recent children’s meetings, was present and Jack Nesbitt gave an excellent word. We appreciated the attendance of the Tampa assembly for this happy occasion. Hatboro, Tent meetings with Albert Hull and David Oliver continued from June 6-30 with an encouraging attendance and some blessing in salvation. Livingston, The saints were greatly encouraged during a series by Walter Gustafson on Assembly Principles. They also appreciated a visit from Gene Higgins. Pennsauken, Tent meetings with Tom Baker and Gene Higgins began on June 23. Interest and excellent attendance marked the meetings from the first night. Blessing in salvation was reported during the first week. Manchester, The assembly appreciated three weeks of gospel meetings with James Smith during which the Lord gave some blessing. The believers were also encouraged by a baptism on June 26 when a woman who had been the object of much concern and prayer was baptized. Methuen, Arthur Ward and Stanley Wells expected to begin a gospel series on July 11. Hardwick, On June20 and 21, the saints enjoyed two nights of ministry by William Lavery. Augusta, The recent conference was good with F. Bartlett, W. Bingham, W. Gustafson, G. Higgins, Bryan Joyce, A. LeBlanc and J. Smith ministering the Word. Bangor, Gospel meetings with Bryan Joyce and local brethren made some interesting contacts although community response was disappointing. Ballykeel, Lange numbers attended the annual conference and helpful ministry was given by A. McShane, S. Ferguson, B. Glendinning, D. Gilliland, W. Boyd and J. Lennox. Belfast, R. McKeown and B. Graham had a well attended series of gospel meetings at Whitehouse with much help in preaching the gospel in this thickly populated area. Cardy, Fain numbers were attending as S. Ferguson and W. Boyd continued into their fifth week of a gospel series. Castlewellan, At last report, J. Palmer and R. Shannon were in their eighth week in the gospel with a good interest. Curnien, N. Tinsley and N. Coulter are having tent meetings near this small assembly A good few locals have heard the gospel in this much neglected county. Fintona, To mark the opening of their new hall, the saints arranged a gospel meeting by W. Nesbitt on Friday night and a ministry meeting by D. Kane on Saturday night. The local people, both Catholic and Protestant, including the tradesmen employed in the erection of the hall, responded in an amazing way and over 300 attended each meeting. Omagh, R. Eadie and A. Nelson have seen blessing in the gospel in this area where there has been much sorrow. Rathfriland, Gospel tent meetings have commenced with A. Davidson and J. Rodgers. Tullylagen, B. Glendinning and A. Wilson have been preaching the gospel for a number of weeks. Stonewall, The hall was well filled for the annual meeting and the assembly was encouraged. Ministry was given by J. Hutchinson, I. Wishart, B. Glendinning, A. Davidson, W. Nesbitt and J. Flanigan. Capivari, The first meeting in the new hall was held on June19. Tom Matthews and Harry Wilson expected to commence a gospel series in the new hall at the end of June. The old hall was taken to Passo de Tomes and erected there. Passo de Torres, John McCann Jr. had a week of Bible readings in June. After ministering for ten weeks in Canada, Tom McNeill planned to be in New Zealand until June30 and then give help in Australia during July and August. Lviv, Saints from the Kapuskasing, Ontario area had a very encouraging four week visit to this city of 1,000,000. Some of them had been there previously in 1995. This time, they gave out 8,450 Bibles and New Testaments which were well received. Four souls professed salvation – one middle aged couple and two teenage sisters. They also met believers who were willing to meet with them to discuss the Scriptures. 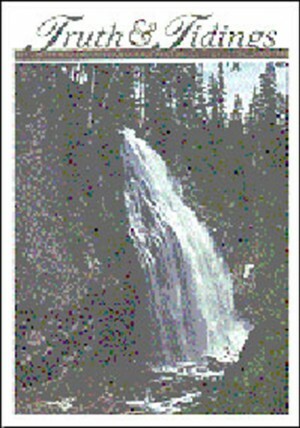 4614, Lennard Heath, Turtlefond, SK, S0M 2Y0, (306) 843-2627 or David Hint, Paradise Valley, AB, (403) 745-2560. September25 and 26 in Chapman Valley Gospel Hall, Hwy. 124 at Miller Rd. Prayer meeting on Friday at 7:30 p.m. Bible readings at 8:45 a.m. on Judgement of Sin, Judgement of Self and the Judgement Seat of Christ (Saturday) and Isaiah 53 (Lord’s day). Breaking of Bread at 10:15. Supper will be provided at 5:30 p.m. on Friday Corn. Herb West, 13 Lakeview Dr., Box 870, Sundridge, ON, P0A 1Z0, (705) 384-5280 or Tom Hulcoop, 9 Edward St., Parry Sound, ON, P2A 2W5, (705) 746-5919. October 2 and 3 in Central Huron Secondary School, 165 Princess St. E., Clinton. First meeting on Saturday at 10:30 am. Breaking of Bread at 10. Two Bible readings on The Status and Activity of the Church following the Rapture (1) During the Tribulation Period and (2) During the Millennium and the Day of God. Prayer meeting in Gospel Hall, 143 Joseph Street on Friday at 7:30 p.m. Corn. Douglas McDonald, P0 Box 329, Clinton, ON, NOM iLO, (519) 565-2752. September 4 and Sin St. Basil’s Secondary School, 250 St. George’s Ave. East, Sault Ste. Marie, ON. Meetings on Saturday at 10,1:30,3:30 and 7. On Lord’s day, meetings at 10:15, 1:30, 3:30 and 7:30. Bible readings both days at 1:30 on Priesthood of our Lord Jesus Christ (Saturday) and Priesthood of Believers (Lord’s day). Prayer meeting on Friday at 7:30 p.m. in the Gospel Hall, Wellington and Spring Streets. Corr. R.A. Clark, 462 MacDonald Avenue, Sault Ste. Marie, ON, P6B 1H9, (705) 759-0968. October 9 and l0 in Parkside Collegiate, 241 Sunset Drive. On Saturday, Ministry at 10:30 and 2 with Gospel at 7:30. On Lord’s day Breaking of Bread at 10, Ministry at 2:30 and Gospel at 7:30. Prayer meeting at 7:30 p.m. on Friday in the Gospel Hall, 1 Sunset Drive. Corr. Lyle McCandless, 45 Pol Crescent, St. Thomas, ON, N5R 5P9, (519) 637-1602. School (519) 633-0090. September11 and 12 in the Gospel Hall, 69th and Hartman, with prayer meeting on Friday at 7:30 p.m. First meeting on Saturday at 10 a.m. On Lord’s day Bible reading on Hebrews 1. Corr. James Harvey, 3139 N. 126th St., Omaha, NE 68164-5204, (402) 498-9008. Hall (402) S71-5983. September 18 and 19 in Aplington Parkersburg Middle School, 215 10th Street, Aplinglon, (319) 347-2394. Breaking of Bread at 10:30 preceded by a Bible reading at 9 on the Meal Offering. Prayer meeting on Friday in the Gospel Hall, RR, Aplington. Corr. Larry L. Brandt, 509 Lincoln Street, Pankersburg, IA 50665, (319) 346-1084. September 5 and 6 in the Gospel Hall, 4603 E. Linwood Blvd. Prayer meeting on Saturday at 7 p.m. On Lord’s day Bible reading at 9:30 on John 17, Breaking of Bread at 11. Gospel at 7. On Monday, Ministry at 10. Gospel at 6. Corr. William L. Jackson, 1613 Ashland P1., Blue Springs, MO 64015, (816) 228-3591. Hall (816) 924-6346. October 23 and 24 in Stark Road GospeI Hall, with prayer meeting on Friday at 7:30 p.m. On Saturday Ministry at 10 and 2:30, with Gospel at 7. On Lord’s day Breaking of Bread at 10, Ministry at 2:30 and Gospel at 7. Corr. James K. Vallance, 47100 Maplebrook, Northville, MI 48167, (248) 349-4258. Accom: Jeff Joyce (248) 442-8858. One week advance notice would be greatly appreciated. Hall (734) 425-4910. September 25 and 26 in the Gospel Hall, 61 Prospect Street with prayer meeting on Friday at 8 p.m. Breaking of Bread at 10. Corr. Edgar Chambers, 303 Huntington Court, Wyckoff, NJ, 07481-2955, (201) 652-4862. Hall (201) 447-0654. September 11 and 12 in Hardwick Elementary School, at junction of Routes 14 and 15. First meeting on Saturday at 10 am. Breaking of Bread at 9:30 a.m. Prayer meeting on Friday at 7:30 p.m. in the Gospel Hall, Lower Cherry St. Corn. William D. Scott, 438 Dimick Road, East Hardwick, VT 05836-9634, (802) 472-6257. Advance notice of lodging requirements requested. John Black of Milton, Ontario on May 18, age 86. Our beloved brother was born in Belfast, where he was saved on January 1, 1930. The family emigrated to Canada in 1951, settling in Montreal and were in fellowship at Ogilvy Avenue, where he served faithfully as an elder. In 1984 they moved to Milton where he continued faithfully. Mr. Black loved to preach the gospel and was active in doing so all his life even up to a few months before his homecall. He is survived by Dorothy, his wife of 63 years, one son, grandchildren and great-grandchildren. Della MacDonald of Englehart, ON on May 20, age 85. Our dear sister was saved in 1970 and attended meetings in Earlton when possible, but was not baptized and received into fellowship until moving to Englehart in 1989. She really enjoyed the meetings and the Lord’s people those last ten years. For a while she returned to her Earlton home and was in fellowship there. Failing health took her back to Englehart to the nursing home. Our sister leaves a good testimony. A good number of nieces, nephews and neighbours heard the gospel preached by D. Nicholson. Muriel B. Howard of Moncton, NB on June14, age 76, two days after having a stroke. Muriel was the faithful supporting wife of our late esteemed brother and servant of the Lord, Douglas Howard, who at 83 went on before her by only five and a half months. She was a true helpmeet and a wonderful mother. Muriel loved to entertain the Lord’s people and was keenly interested in the gospel. She is survived by two sons and three daughters, who were able to be at the funeral, and 13 grandchildren. The large funeral was shared by Ken Taylor and Robert McIlwaine. Ivan Rodgers of Sudbury, ON on June 18, age 66. Our dear brother was born to Christian parents in Kirkland Lake, ON and was born again in Rollet, PQ in 1948. His latter years in assembly fellowship in Sudbury were some of the happiest years of his life. The large funeral and attendance at the funeral home attest to his having been highly respected in the community. Ken Moore, a special friend, and Ivan’s cousins, Bruce and David Rodgers and Murray Pratt, shared in the funeral service. He is survived by his wife Frances, three children and seven grandchildren. Mrs. Fronia (Aunt Fronia) Sarah Pike of Red Bay, Labrador on June 22, age 73. Our dear sister was saved in October 1958 and was baptized shortly afterwards and received into assembly fellowship. Aunt Fronia was a mother in Israel with a pleasant countenance and even during the four years of her illness, the joy of the Lord was seen on her face. The very large funeral was shared by Francis Barney and Bert Joyce, with Eric Fowler speaking at the grave side. Please pray for her husband Thomas who is not saved but attends meetngs all the time. Fred Reilly of Bethany Lodge, Unionville, ON on June 24. Our dear brother was born in Dublin, Ireland in 1905 and saved in 1922 through the preaching of W.P. Nicholson. He was in fellowship in Letterkenny and Londonderry before coming to Canada with his wife in 1955. He was a respected elder at Pape Avenue until moving to Bethany Lodge in 1985 and then in fellowship at Unionville. Our brother was a godly man who loved his Lord, the saints and the assembly He is survived by two sons, four grandchildren and seven great-grandchildren. Mr. Reilly was the father of Robert Reilly, Treasurer of Truth & Tidings. Harold Meinberg of Hampton, IA on June 27, age 83. Our dear brother was saved in late 1939 through Romans 5:6 and John 19:30 while walking across the yard of his parents’ home. He was in fellowship at Hampton and was an esteemed overseer for approximately 50 years. Our brother was consistent in attendance at the meetings and was planning to come the Lord’s day he passed into the Lord’s presence. He is survived by his wife Marian and two daughters, Linda Alberts of New Lenox and Marlys Osman of Hampton, five grandchildren and five great-grandchildren.